While visiting a friend in Suncheon this weekend, I crossed paths with the elusive Korean mulberry. Thinking back to previous mulberry experiences (really lack thereof), I can only recall singing about such fruits rather than eating them. "Here we go 'round the mulberry bush," remained a staple of daycare sing-alongs, and until recently, I didn't even know what a mulberry looked like. Upon a first glance, the mulberry (오디 in Korean) vaguely resembles a raspberry. Upon further inspection, however, the mulberry is longer in shape and darker in appearance. The taste, too, is less sweet than that of most fruit. Unfortunately, this taste has been erroneously labeled "bland"- what a misconception. My first taste of mulberries remind me of my first bites of dark chocolate, or sips of coffee, all of which seem wonderfully strange at first, but gradually became an acquired and sought after taste. Thankfully, mulberries will be in season through the end of September. Besides Korea, mulberries can be found in warm and subtropical areas, especially regions of Asia, Africa and the Americas. Although over 60 different species of mulberry exist in the world, the Morus tiliaefolia, or the Korean mulberry, mainly subsists in this country, namely the Jeolla province. Once ripe, mulberries are used for a number of dishes. Although it is widely-used for jams and cordials, a popular way to mulberry treat in Korea is a "iced mulberry juice" (the way I have enjoyed it). Although a little sugar is sometimes added to the mixture, the overall taste a very smooth and indicative of the mulberry taste. Besides food, mulberry plants are used in a few other ways. 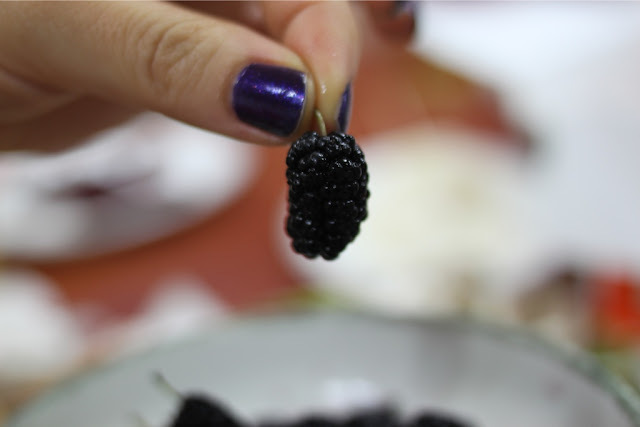 In many parts of Asia, mulberries are used in the production of silkworms, which feed exclusively on its leaves. The country which takes the most advantage of this is China and India, as well as parts of Thailand and Brazil. Countries also use the plant for wood productions and landscaping. Mulberries also yield a few health benefits. A mature mulberry plant contains significant amounts of resveratrol, which has been linked to lowering blood sugar. The fruit also contains anthocyains, which are pigments that that hold potential use as dietary modulators of mechanisms for various diseases. In traditional and folk medicine, the fruit is believed to have medicinal properties. Although the mulberry can be found in the southern regions of Korea, it's quite difficult to locate in Seoul. In some local fruit stands and markets, it may be possible to find this fruit; however, it's impossible to pin down this fruit with any form of regularity. I have seen the mulberry a few times this season at my local fruit stand, but it seems more sparse as the fall season edges closer. Hopefully, you get to consume this seasonal berry. Whether you seek it out in its homegrown locale, or serendipitously stumble upon it in your market, do not hesitate. These berries prove worth the seasonal search. Happy hunting.